Muriel Evelyn Heath, 89, died at the Pavilion Nursing Home, Sidney, Ohio on Sunday, September 10, 2017. She had bravely battled Alzheimer's for many years. Her son, Bruce and daughter, Jill, were by her side. Muriel was born September 1, 1928, the daughter of Eldred O. Morton and Thelma (Howe) Morton, both deceased. She and her sister, Gloria, spent their early years in New Jersey and Lincoln, Nebraska, then settled in Mansfield, Ohio. While studying for her Bachelor's Degree at Ohio State University, she met her now deceased husband, William Heath. They married and graduated together in 1950. Muriel was a dedicated creative educator her entire life, both professionally and with her children. 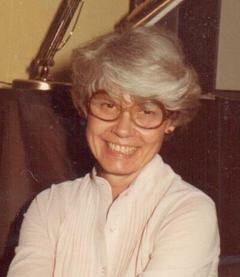 She taught Home Economics and Child Development for the Sidney School System. Her talents as a seamstress were invaluable for multiple high school musicals. Her varied interests and contributions also included being an active member of the Sidney First United Methodist Church where she shared her musical talent singing and generous spirit serving the church. She adored being a hostess inviting friends over to enjoy her hospitality. She used her cooking skills teaching a "Bachelor Basics" class at Sidney High School and teaching American cooking to groups of Japanese ladies from Honda. Muriel had a special heart for the vulnerable and forgotten, both people and animals. Her loving care for animals was legendary. Innumerable people benefited from her sacrificial generous help, especially her family. She is survived by her son, Bruce, daughter, Jill, grandson, Christopher, and sister, Gloria (Morton) Mercer. She was preceded in death by her beloved husband William and son, Bill (Hector). Her children especially will miss her, along with so many lifetime friends who also enjoyed her spirited personality and talents she faithfully used to serve others, and her Lord and Savior. Funeral services will be held on Saturday, September 16, 2017 at 2:00 PM at the Sidney First United Methodist Church in Sidney with Rev. David Chivington. Friends may call at the church from 1:00 PM until the hour of the service. Burial will be at a later date at Tomlinson Cemetery, Mendon, Ohio. Salm-McGill and Tangeman Funeral Home in Sidney is handling the funeral services and condolences may be expressed on Salm-McGill and Tangeman Funeral Home's web site at: www.salm-mcgillandtangemanfh.com. Muriel would have loved memorial donations in her memory to two of her favorite charities. For years she sponsored children through World Vision and assisted rescued animals through Best Friends Animal Society. Contact information for World Vision: www.worldvision.org/donate, for Best Friends Animal Society: https:/bestfriends.org/ We rejoice her struggles have ended and she is now happily enjoying eternal life with the Lord and loved ones.